Pause Game. The land area available is pretty straight forward. There are plenty of trees for furniture making, clay pits, gold mines and 3 scattered iron mines. We can also grow grapes and breed sheep. I decide to place the city block to the east of the central forest. The block will be slightly bigger than Narona (it is actually a remake of a block used in Ephesus - the first city guide I made). I make room for walls that will allow domus to evolve to full capacity. 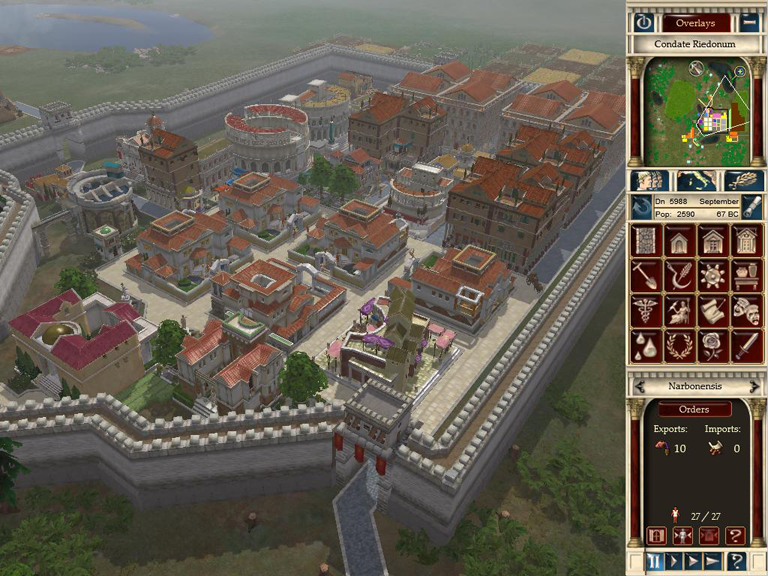 The block has room for 11 Insulae, 8 domus and 5 villas. Populationwise it is 60 people short. There's room for two more villas so I will probably go for that option, and get more prosperity, than build 1 insula and risk decreasing prosperity. 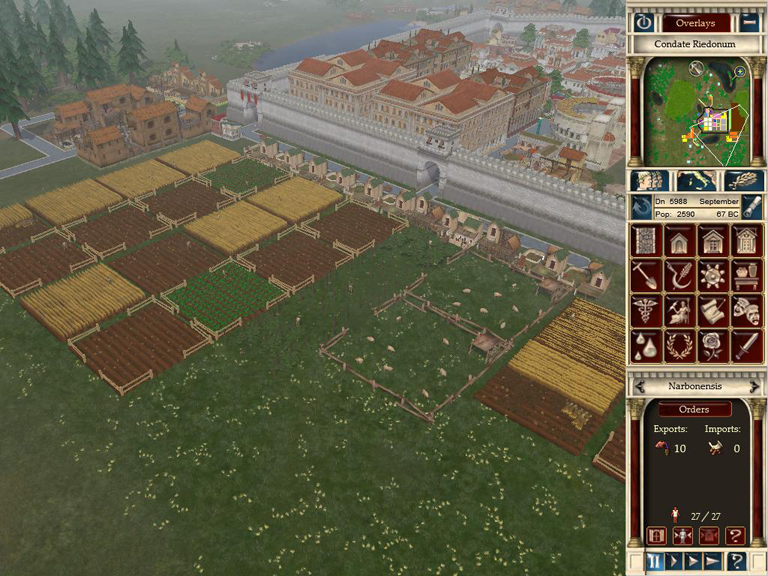 I build 2 grain farms, 2 vegetable farms, 1 sheep farm and 1 grape farm to the east of the city block. I place a wine factory and a clothing factory at the south side of the farms. The other factory area is located to the south-west of the villas. It has one of each timber cutting camp, clay digging camp, gold digging camp, pottery factory, a jewelry factory and a furnityre factory. Each factory sector get 1 warehouse each. Unpause game. People flock to the newly founded city. Resources build up and I open factories when the camps are about to get full. The crops are harvested and gets moved to the newly opened food market. Open Tax office! By June all my plebs are employed, with a handful missing. The last 2 insulae are built. As soon as I have some pottery I open the basic goods market. By the end of the year I open trade routes to Narbonensis and Germania Superior. I set storage limit to 6 without export limit. I open the luxury market and only allow it to sell furniture for now. In December Jupiter destroys my Luxury market because I failed to build a shrine. Bummer! 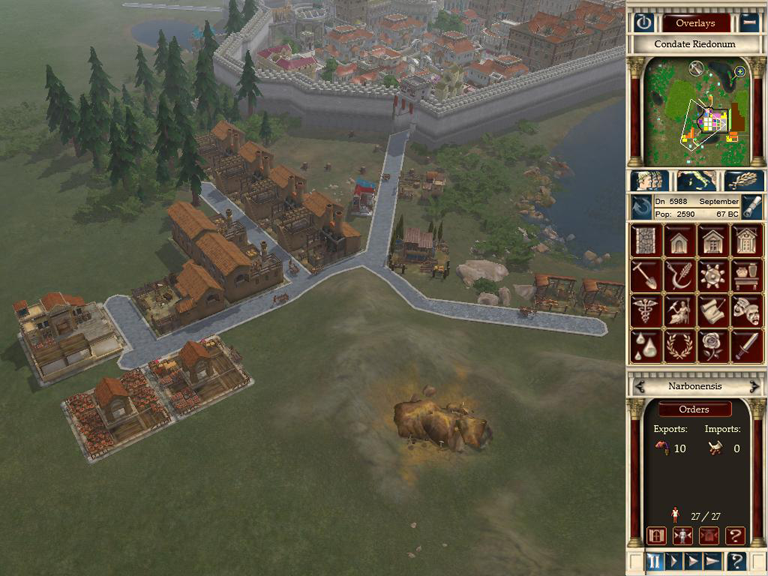 Some insulae has evolved and I have now 141 unemployed plebs. All types of factories expand by 1 each. By March most of my residential buildings have or are about to evolve at least once. I expand grain and vegetable farms by 1 each. A granary is built along with an odeum and a domus. I allow the luxury market to sell jewelry to allow maximum domus without walls. It is also time to bring in partricians to boost tax income. By July my unemployment of plebs reach a new height - 364 in total. To combat this I build 1 grape farm and 2 more wine factories. In August Rome requests 15 pottery. Stocks are at 6 so I stockpile for a bit. The only villa demands better desirability and healthcare so I give it plazas and a barbershop. The rest of the year is spent watching wine production and storage after changing the export limit to 30. By the end of December the pottery is shipped. To get pottery on the right track (and reduce unemployment) a second clay digging camp, and 2 more pottery factories are built. The villa block is slowly developed. In March Rome demands both wine and pottery, 25 of each(*). I have the wine but not the pottery. A shrine to Bacchus is built to boost wine production. The western factory sector gets a warehouse to store pottery only. In September there's enough pottery to ship to Rome. So it is done! The villa block has expanded to 5 medium villas all demanding more entertainment so they get a theatre. The last 4 domus are built. I throw in a vegetable farm and a grain farm too. The last thing I do this year is untick the stockpile option on pottery that I forgot about in September. Funds are currently 2828 Dn. I've just started to import honey with an import limit of 2. Once it arrives an exotic goods market is built. I build an iron mining camp and weapons factory in preparation for the arena. In the meantime they get a school. The arena is up and running in June. The villas now range from large villas to small estates. The city also gets a shrine to Ceres. Mars is the only one left out. In August Rome requests 15 wine. Stock is 34 so I send some. In October I start importing fur with an import limit of 2. I also slowly start working on city walls. Before the year ends I've opened trade route to Sardinia for some additional wine export. The end game starts. I rearrange the pump house and reservoir slightly to make room for my city walls. I leave enough space for a governor's villa and some decorations around it. My pottery production is going too well so I start exporting some surplus to get extra income. Speaking of lost income, in March Rome demands 25 wine and I send it. 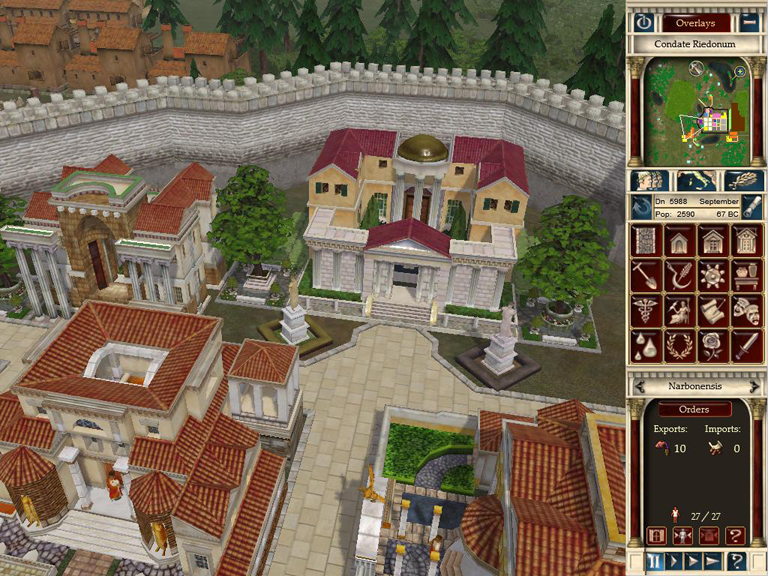 By building a basilica all villas start to evolve to medium estates. In August Rome demands another batch of pottery. Shipment is sent straight away. In May 67 BC all requirements have beem met except for population (missing 60 people) and favour (48/50). There is no room for an additional 2 villas or a domus. My only option is to build 1 more insula and maximise it, and also build a hospital and import a third luxury good to be able to evolve villas to large estates. Some of my partricians get their hands on some incense so all I have to do is send Rome a small gift to boost favour and win the scenario. * In the Imperial menu the orders have swapped titles. Clicking Pottery shows wine order and vice versa.